I have been hankering for some “meatloaf” recently. It is partly a nostalgia thing, but I suspect it could be because I am travelling to Germany in May and I’ve been doing some research on vegan restaurants there. I have one vegan place I want to check out in Dresden that does the full vegan treatment of the German meatloaf, cabbage and potatoes thing. My mum used to make meatloaf for dinner and we’d have the leftovers on sandwiches for our school lunch. I wanted to recreate that sandwich experience. 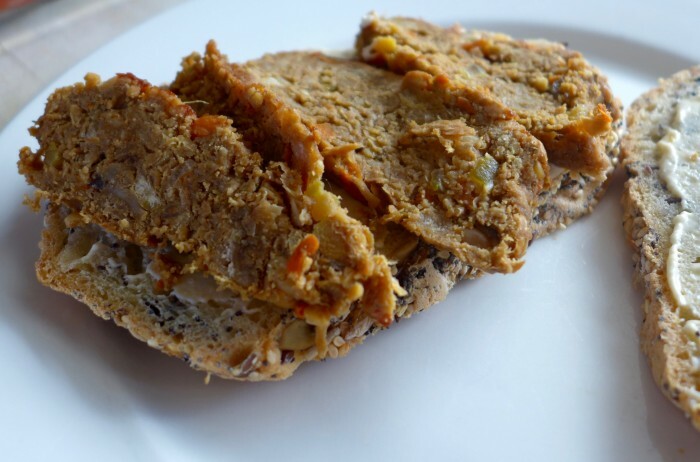 So I went looking for vegan meatloaf recipes on the web and settled on this one at Chow Vegan. It is based on a chickpea cutlet recipe from Veganomicon. I thought it sounded promising because it included gluten flour which I thought would give it a decent springiness and chew. Most vegan burgers and loaves fail for me because they lack texture, ending up tasty, but disappointingly soft. Texture is one area where seitan really excels. Sorry dear coeliac friends, but this one isn’t for you. It is quick and easy to make, slices well and has a little bit of pleasing chew to it. The loaf turned out a pretty successful replica of a traditional Mum-style recipe and I can see it becoming a regular part of my repertoire. Naturally, I tinkered with the recipe a little, doubling the onion, and adding some Sriracha to the ketchup glaze and varying the spicing. I’ve been eating it on sandwiches for the last couple of days. My sandwich today was on some home-made multigrain bread, with hummus, roasted pumpkin, leeks and capsicum. Delicious.